Brits love Eton Mess – a summer dessert of cream tossed with meringue and strawberries. Me, not so much, but I thought I’d combine the flavours of this popular dessert in a white chocolate fridge cake. Mmmm … it turned out great! I’m not really a fan of Eton Mess. Now, if you’re British, you probably have a shocked look on your face right now (‘She doesn’t like Eton Mess? What kind of a British food lover is she?’) If you happen to not be from the UK, the look on your face might be resembling something a bit more confused (‘What on earth is Eton Mess, anyway? Sounds … errr … messy?’). Well, just to enlighten those of you who don’t happen to speak the Queen’s English, Eton Mess is a pretty clever and popular summer dessert over here. It’s a really quick, no-bake dessert that is basically just whipped cream mixed with crumbled meringue and red summer fruits – usually strawberries. Apparently, it’s traditionally served at Eton College’s (a very posh private school) annual cricket game against Harrow (another very posh private school). In other words, as English as English as English can be! It’s a dessert found on many menus at this time of the year and a firm favourite – it’s just that I’m not a cream, meringue and fruit sort of girl. I’m more a chocolate-y, biscuit-y and fruit kind of girl … which leads me neatly onto introducing this Eton Mess fridge cake to you. In the UK, traditional fridge cake is just crushed digestive biscuits (a bit like Graham Cracker cookies!) mixed with melted butter, cocoa, syrup and dried fruit. It’s all squashed into a cake pan, then smothered in a thick layer of chocolate. Mmmm …. so inexplicably delicious and definitely one of my favourite treats! So anyway, lately I’ve been taking my work to quite a lot of cool coffee shops around my city (ever tried that? I love it and I swear I get more work done surrounded by all the chattering, coffee smells and great music). In my favourite café I recently saw something a bit like this Eton Mess fridge cake. 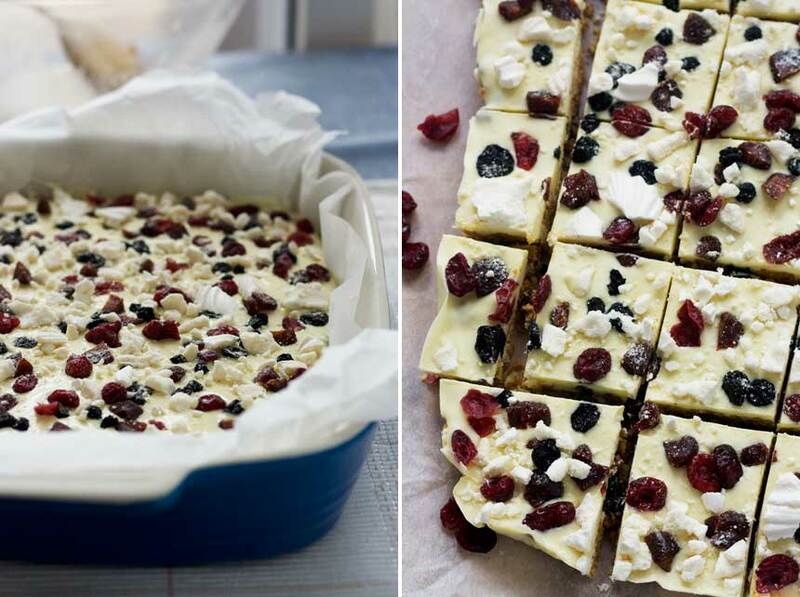 I didn’t try it, but to me it looked like a white chocolate version of fridge cake with a bit of meringue and fruit. I thought it couldn’t be too hard to come up with my own version, and I wasn’t wrong. 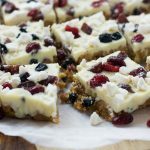 The most fun part of making these is generously sprinkling the crushed meringue and dried fruits (I used strawberries, blueberries and cranberries) all over the melted white chocolate at the end. Pretty as well as delicious! P.S. Don’t worry about the ‘Digestive biscuits’, ‘Golden Syrup’ and ‘meringue nests’ in this recipe if you don’t happen to be in the UK. 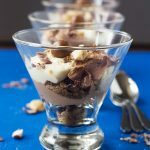 Yup, these are all very British ingredients, but you can use a different kind of cookie (Graham crackers or a simple crumbly type cookie are fine), honey or maple syrup and any kind of pre-cooked crunchy meringue! 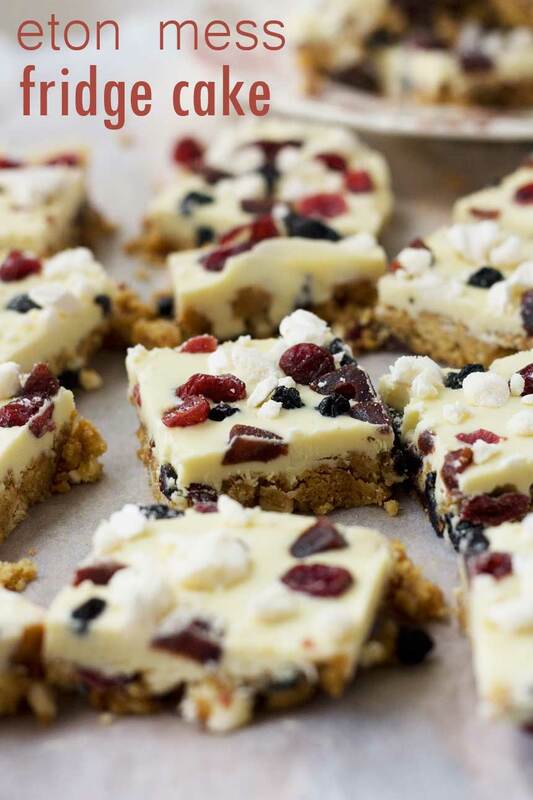 A delicious white chocolate fridge cake with all the flavours of the classic English dessert Eton Mess. 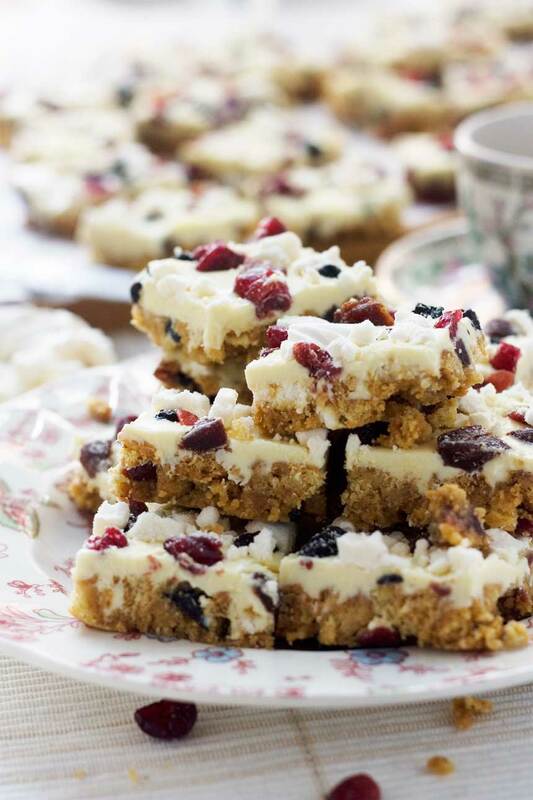 Just mix crushed biscuits with butter, syrup and dried red fruit, squash into a baking pan, smother with melted white chocolate and sprinkle with more meringue and dried fruit. Just gorgeous! Line a baking tin (mine was roughly 30 x 23cm) with baking paper and set aside. Tip the biscuits into a freezer bag and crush them into smallish pieces using a rolling pin. Pour into a large bowl. Melt the butter in a saucepan, then add the Golden Syrup. Set aside to cool a little. Add about half of the dried fruit and the two crumbled meringue nests to the biscuits in the bowl and mix well. Then pour in the butter and syrup mixture and stir until all the mixture is coated. Break the chocolate into a bowl, then microwave in 30-second bursts to melt (3 x 30-second bursts worked for me, then I stirred the chocolate well to finish off melting it). Spread over the biscuit cake, then sprinkle the rest of the dried fruit and the remaining crumbled meringue over the top. Leave to set completely in the fridge. Cut into smallish squares and enjoy! 1. If you can’t find Digestive biscuits (UK), Graham crackers or another hard crumbly cookie is fine. 2. Similarly, if you can’t find Golden Syrup, you can use honey or maple syrup instead. 3. Here in the UK, pre-packaged meringue is sold in little ‘nests’. If you can’t buy these in your country, any type of meringue is fine – just so long as you use about 25 grams and a bit extra for sprinkling! Addictive peanut butter Cheerio bars Greek Christmas honey cookies (melomakarona) No bowl chocolate pecan bars recipe (magic bars) Easter chocolate bark (with a video) Chocolate lollipops (homemade food gift with video) Chocolate-dipped Oreos (with a video!) 11 easy homemade chocolate gifts The easiest peanut butter cups in a jar (homemade food gift!) 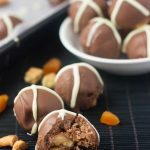 Toffee apple chocolate bark Biscoff & white chocolate blondies ‘Hot cross bun’ truffles Chocolate stout cupcakes with peanut butter frosting Coconut & pistachio chocolate heart & star cookies FIVE last-minute chocolate gift ideas! Before Digestives were available here in the US, I used to hoard them on trips back from the UK. One time I got stopped by security with 7 rolls of those and hob nobs in my carry on. I got some odd stares before I finally mumbled, “I really like these cookies.” Embarrassing. Anyway, i love all of the things in these bars, so I’m excited to try them! Oooh, I love Hobnobs, too! That’s hilarious that you took so many back with you! I’ve heard you can make your own … I must try that! Hi Helen, never heard of this dessert before. Like how you changed it up to make it your own. England sounds like such a grand place. Hope to visit some day. Hi, Cheri! England is OK, but not on days like today when it’s rained absolutely ALL day! So glad you like the sound of this fridge cake. It’s so simple and very easy to make your own! This. Is. GOLD. I adore Eton Mess (seriously, how unpatriotic of you to not love it) but it is such an effort to make! Seeing this makes me think of a zillion other variations that could be done. I love this SO MUCH! Wait, you ‘think’ you love me? Now come on, Nagi, you can do better than that! You definitely could make a million different versions of this. That’s what I love about it – just throw everything in a bowl with a bit of melted butter and syrup and you can’t go wrong. I’ve never heard of eton mess before, but I do like the sound of it! This sounds like an even better version, Helen! I love the flavors in here. What a perfect treat! I am not usually a fan of eton mess either, as it has too much cream, so this sounds like a good solution. I love that it is called fridge cake too. Okay, I may not be British, but this cake literally looks like EVERYTHING! White chocolate is my life and I’m dying over all that gorgeous dried fruit you packed into these beauties! I don’t even care that the weekend is over–these need to happen ASAP! Hehe … eat away, Sarah, weekend or not! Glad you like them! Well, I have never heard of Eton Mess or fridge cake but both sound like of good to me? Regardless, your dessert looks absolutely delicious, what lovely presentation. I’ll send you my address for shipping purposes, hehe. Beautiful Helen! What a brilliant idea this eton mess cake is, Helen! I am a “cream, meringue and fruit sort of girl” AND I am a “chocolate-y, biscuit-y and fruit kind of girl” so this is PUUURFECT!!! Lol, I was one of those people who was like, ‘what on earth is Eton Mess’? Now that I know, it looks and sounds wonderful! I am also more of biscuit and chocolate kinda gal too, so this version is fantastic for me! 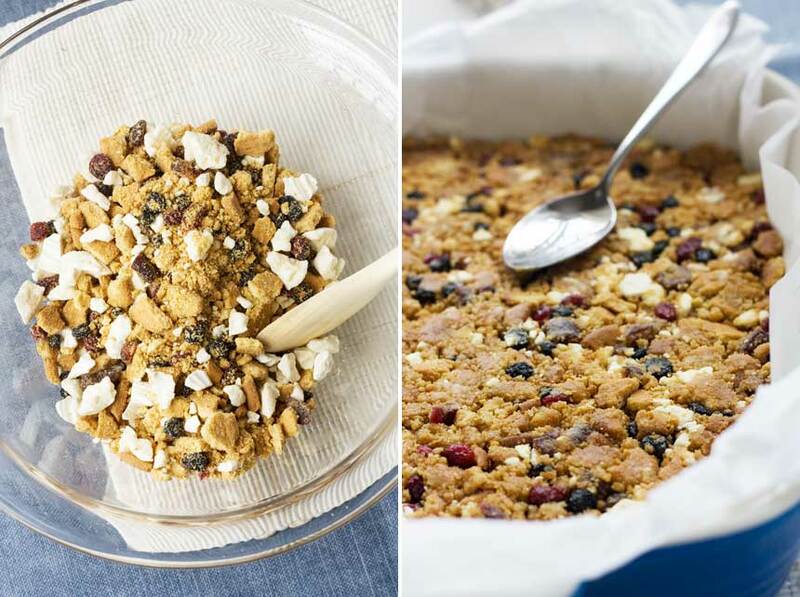 And I love that its no-bake! Oh my goodness, this is beautiful! Wow, the colors and layers and textures – I didn’t even have to get to the recipe before I was sold. I really like how you did your photos Helen, they’re fantastic! White chocolate, biscuits, what is not to love here? Pinning for sure! Awww, thank you so much for your enthusiasm, Frances! I should have known that this would be up your street as you’re such a master baker! Thanks for the compliment on the photos, too … the cake is pretty, so I guess that helped! A quick, no bake meringue with the word “Mess” in the title has me all sorts of giddy! Plus this looks delicious! 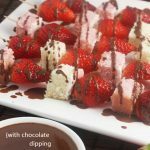 I’m definately giving this dessert a try! Thanks for sharing the yum♡ Cheers, girl! I’ve never HAD a traditional Eton Mess, but….I’m pretty sure I would take a few slices of this cake over one any day! Eton Mess, such a great combination and I’m craving it right now!!! Love it, thanks for sharing Helen! Great idea to use digestive biscuits! Thank you, Sweet Mira! I’m happy that you like this (and that you know what digestive biscuits are!) Have a lovely weekend! I do not speak the Queen’s English, but I did stay at a Holiday Inn Express last night. LOL! I could eat the Eton Mess no problem but this looks more up my alley anyway. I don’t do croquet but I can play a mean game of beer pong! I would probably win especially since everyone would be distracted by this amazing dessert! Being Aussie you are talking my language and know what all those ingredients are. Eton mess is very hit or miss with me. There has to be more texture than cream for me to enjoy it. 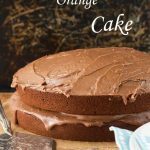 I love this idea of making a fridge cake using the flavours, genius! Eton mess sounds like pure heaven to me! And your fridge cake looks delicious, too! Love all those flavors, Helen! Oh boy, now I’m starving! These look so very tasty, Helen! I love every one of those flavors and together….just, YUM! What a scrumptious and brilliant ETON MESS, Helen! Have to admit we never had Eton mess before and with your inspiration we have to remedy that quickly. Wonder what can we use instead of digestive biscuits or Graham Cracker because they are pretty high in carb. I’ve never tried (or even heard of!) Eaton Mess, but I definitely want to try this. This looks delicious!